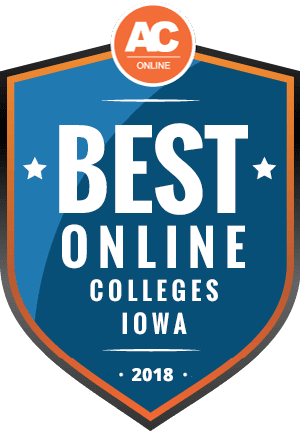 Why Choose Iowa for Online Higher Education? Like many states, Iowa is undergoing a transformation. As more positions in the state require higher education, Iowa is working to expand its educational offerings, including more online programs to help people transition to new careers. These online programs are also available to students living outside of Iowa. With the state’s lower than average tuition rates and affordable online degree options, Iowa could be the right place to get your degree. Below, you’ll find the best online colleges in Iowa. These rankings are based on the Integrated Postsecondary Education Data System (IPEDS), which is presented by the National Center for Education Statistics (NCES). The schools below are ranked on student-to-teacher ratio, cost, graduation rates, and more. Each school must be accredited and offer a minimum of three online programs in order to be considered for these rankings. The growth of online programs in Iowa has made it easier for people to earn their degrees. Whether you live in the state or not, Iowa’s online offerings can help you advance your career through flexible, affordable programs. At public colleges and universities, out-of-state students usually pay higher tuition rates than in-state students. If you are considering studying in Iowa, you can establish residency in the state by living there for 12 consecutive months, being enrolled at least half-time during those months, and working at least 30 hours a week. Online programs often charge less for tuition than their on-campus equivalents, and many charge the same tuition regardless of state residency. Below, you can see the difference in costs for in-state and out-of-state tuition in Iowa. Iowa tuition is lower than the national average for all students in public universities and college, but the savings are greater for in-state students. Most colleges and universities charge less for online courses, though additional technology fees may apply. Attending online means you don’t have to live on or near campus, which can save you money. As you can see from the table below, online programs in Iowa are more popular with out-of-state graduate students than with out-of-state undergraduates. Online graduate programs are often geared toward working professionals who can’t relocate as easily as undergraduates fresh out of high school. Iowa is a member of the Midwest Higher Education Compact, a group of 12 states that work to promote and improve higher education. One of the ways they do this is through the Midwest Student Exchange Program (MSEP), which allows students who reside in those 12 states to attend college in another MSEP state for reduced tuition. Students making use of this program save between $500 and $5,000 per year. Not all schools in these states participate, so if you live in an MSEP state, check the website for more details. The National Council for State Authorization Reciprocity Agreements (NC-SARA) helps to streamline the process of out-of-state online enrollment. Check this list to find NC-SARA approved schools in Iowa. This section includes frequently asked questions about online programs in Iowa. These questions and answers can help you find the right college. Do Online Credits Cost More or Less in Iowa? Tuition in Iowa is slightly lower for out-of-state students than the national average, while in-state tuition is noticeably lower than the average. Online credits generally cost somewhere between in- and out-of-state tuition prices. Which Iowa Schools Accept the Most Transfer Credits? Schools have different guidelines for determining which credits will transfer, as well as how many credits can be transferred. Online programs, especially those geared toward quick completion, sometimes allow for the transfer of more credits, and often from a wider variety of sources. If you already have credits, make sure to investigate your transfer options. If you have most of the required credits for a degree but cannot or do not want to finish at your current institution, online programs can often help you stretch those credits further, saving you money. Will Any Online Colleges in Iowa Accept a GED? The GED, or the general educational development test, provides a way for people who have not graduated from an American high school to prove they have the same basic knowledge and competencies as those who have. Public colleges and universities in Iowa accept applicants who hold a GED, although they may require minimum scores. Private universities may be less likely to accept applicants with a GED, as they have more leeway in setting admissions standards. It can be easier to enter a community college with a GED, allowing you to subsequently transfer to a four-year university based on your college grades. The specific requirements for admission are set by each institution, so the only way to be sure about a college or university is to check with their admissions department. How Many Academic Terms per Year Do Online Colleges in Iowa Offer? While online programs can be more flexible with start dates, most stick to the standard patterns provided by on-campus programs. Colleges and universities generally follow the semester, trimester, or quarters model. Semesters are split between fall and spring, each running roughly 15 or 16 weeks, while trimesters split the year into three, four-month long periods, and quarters split the year into four three-month periods. Most online classes follow the same model, as they are taught alongside the college’s on-campus offerings. Programs which are only offered online sometimes follow different models, such as accelerated courses, which are generally offered every eight weeks. These programs are designed to help students complete their degrees quickly and are more common to graduate programs. Which Online Colleges Will Accept the FAFSA in Iowa? As a general rule, all accredited online colleges will accept the Free Application for Federal Student Aid (FAFSA). The FAFSA can qualify you for government grants, scholarships from private organizations and colleges, work-study opportunities, and/or student loans. It should be your first stop when determining how you will pay for college. Many schools require you to submit the FAFSA even if you plan on paying out of pocket, as it helps them determine if you qualify for financial aid from the school itself. When you file the FAFSA, you will have to nominate one or more institutions to receive your financial information, so it helps to know to which schools you have applied to or been accepted to when you submit. Are There Any Free Online Classes I Can Take from Iowa Colleges? Like other states, Iowa’s colleges and universities offer students free massive open online courses (MOOCs). Iowa State University offers a MOOC program through two online learning platforms: Canvas Network and Class Central. Anyone can take these courses. As a result, the MOOCs at Iowa State do not confer college credit, but help students acclimate to online learning and explore areas they may want to major in. How Can I Find the Online Program Options at Iowa’s Colleges? This guide contains a ranking of the most affordable online schools in Iowa, so you can start here when searching for an online program. To find the online offerings at a specific college or university, check their website. Many will feature a link on their homepages, but if not, simply search the school’s website. When looking for financial aid for college, always start by submitting a FAFSA. Next, search for state-specific scholarships and grants, like those listed below. This scholarship is for first-time college students who graduated from an Iowa high school or completed a high school equivalency diploma within the last two years. Preference is given to students who have aged out of the foster care system or graduated from an alternative high school. This scholarship is for graduating high schoolers who have participated in the Iowa State Fair and who plan to attend an Iowa university or college. The scholarship can only be applied to the first year of study and cannot be renewed. This grant is for undergraduate students at Iowa private universities. It is awarded based on financial need and can be renewed for up to four years of full-time undergraduate study. Part-time students may be eligible for a reduced award. This grant is intended for Iowa community college students who are enrolled in a career or technical program. Applicants must be Iowa residents, must demonstrate financial need, and must be enrolled in at least three credits in a qualifying program which lasts at least 15 weeks. Open to high school seniors or college students, this scholarship is intended for Iowa residents who plan to or already attend college in the state. Applicants must prove financial need, have a high GPA, provide two reference letters, and write a 500-word essay.